I cannot believe how many comments my last post generated! A common love of Star Trek even brought out some folks I didn't even know were reading! Thank you all so much -- for the blogiversary wishes, the Star Trek comradery, and for being so darn fun in general. (And by the way, I saw the movie again last night with Sophy and Erica and I believe it was just as good, if not better, the second time). So in the past few months, as I have worked on some attention-requiring projects and have tried to hone my pattern-writing skills (thus attempting to wake up the math part of my brain), I seem to have developed an addiction to triangular-shaped objects to be worn around the neck. There's something calming about them to me - they move so quickly at first (instant gratification! ), then as they grow you get to enjoy long, repetitive rows that can be worked without thinking too hard. The first in this series: the Koigu Kerchief. Notes: Talk about a calming knit - all the garter stitchy goodness of this kerchief made me very happy. This was one of those projects that I kept around when I needed a break, I worked on it off and on (sometimes just one row per sitting), and one day it was time to bind off. Mine is not as long as the pattern calls for because I ran out of dark red yarn, but I like it mini, too. I didn't really plan how the colors would come out - I just wound those Koigu ends and started knitting with nary a plan - but I love them together! I feel like there's something '70's-ish about the combo. 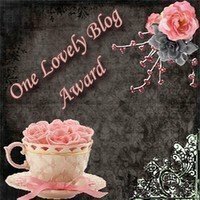 And finally, I have been honored with the "One Lovely Blog" award by the Clumsy Knitter (And really, she is anything but. Her knits are AMAZING and everything she makes seems to involve intricate lace or cable patterns that she executes beautifully.) and Kristen of Learner's Per-Knit (isn't that an adorable blog name?). Thank you so much, ladies! I love it! Such a cute kerchief. I am delighted to hear Star Trek was just as enjoyable the second time because I want to see it again too! and also, Star Trek was just as awesome the second time around. i wish we had seen a matinee so that afterwards we could just sit in a tea house and talk about the movie! Shucks, thanks for the shout-out. I'm blushing! That kerchief is CUTE CUTE CUTE! Now I've got to finish up MY Koigu project-- the mittens that you graciously sent me yarn for! Just one more thumb... why is it so hard to do that one last bit?? love the scarf, it is a very cute knit! and i bet it will be perfect for your san fran summer weather!